This week at Just Add Ink we've got a colour challenge - Early Expresso, Soft Suede, Regal Rose and Rose Red - a colour combo that I've never used but is very, very pretty. Anyway, enough of the rambling, this is what I made for my friend Felicity's birthday, which is today (Happy Birthday chickie). 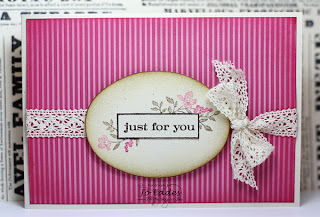 I used my Soft Suede, Regal Rose and Rose Red markers to ink up floral frame from Just Believe and stamped it onto Naturals Ivory﻿ cardstock oval, which I cut using my Ovals die. I then inked up the image again in Early Expresso ink and stamped it onto a scrap, added the sentiment and cut just the frame portion out and adhered it over the coloured image. It's a bit hard to tell, but I've spritzed with with some Champage Simmer Mist (I need to add more paint to this mixture - it's not quite sparkly enough) and then added some Tea Stain and Mahogany ink (from the Distressing Kit) to the edges. I've also inked the edges of the DSP using Rose Red ink and there's a couple of teeny, tiny pearls on the Regal Rose flowers. The crochet trim can be found in the Summer Mini. Be sure to check out what the rest of the Design Team have come up with, all gorgeous as usual. Jo this is just so pretty! I love the crochet ribbon - I am so gonna have to get some of that! I this is such a regal looking card, and I love the lace. Beautiful, Jo. Now why don't I have that stamp set yet ...? This is just so stunning...one of my all-time favourite cards! So nice to see something other than the basic common styles that are so common these days! The crochet ribbon teams up beautifully with the beautiful colour palette!! 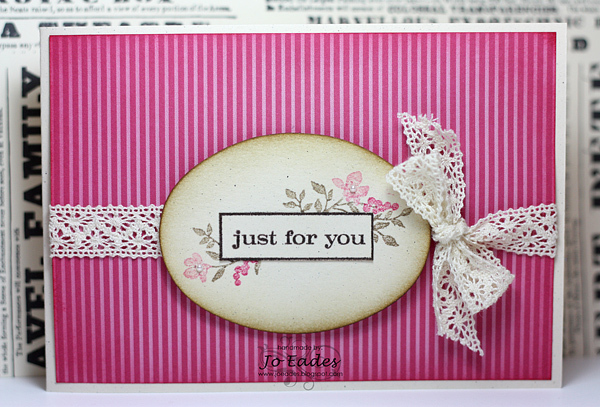 Love how you've put that stamp inside the oval and done some sponging - gorgeous! Loving your card Jo - sponging, lace.... I really should get that set myself. It is beautiful Jo - the oval makes a great focal point and frame. Timeless and lovely!